A school drumming workshop run by Active Rhythmology delivers an opportunity for fun based VAK learning and allows students to take part at their own level all across Leeds and Yorkshire. Testimonials from teachers and head teachers at Benton Park High School in Leeds and New Pasture Lane School in Bridlington. Click here to watch a video of one of our drumming workshops - this format worked so well with children that we now use it with adults as well. Read as much as you wish to get ideas about what we can do for you then visit the Contact page to get in touch so we can advise on the best option for your school. You may notice how quickly we engage everyone in the drumming activity. Hand drumming and percussion have a short learning curve - making drum circles an easy access route to school music at a performance standard. Imagine how the confidence developed through improvising contributions to the school drumming circle boosts self esteem and encourages students to then go on to explore other musical activities. For many the freedom to play a hand drum or percussion instrument is the switch that lights up their musical aspirations. Whether they choose another instrument or stay with drumming, the door to creativity has been opened. The sights, sounds and physical activity of a school drum circle workshop form multi-sensory inputs that involve students in visual, auditory and kinesthetic (VAK) learning. New connections built with whole brain learning activities must surely help with other subjects. When involved with rhythm, school and college pupils or students of all ages learn timing, co-operation, listening skills and self-expression. This helps with core subjects while the rapport and confidence developed aid social interaction. Hand drumming can be incorporated with Brain Gym as a cross crawl activity and is also aerobic, so Active Rhythmology workshops are a good start for those who are reluctant to exercise. There is no pressure to learn specific parts to play, so even those who are ‘musically challenged’ make a valuable contribution and gain a sense of achievement from taking part. In a facilitated school drumming workshop by Active Rhythmology, students learn basic hand drumming skills in a few minutes and then move on to improvising rhythms. This is very different to African Drumming, Samba Band or other single culture activities where students can feel left out if they are not able to play the parts given. After learning a few basic skills, playing a short burst of rhythm when it is their turn and then having the whole class play it back is a great confidence booster for timid pupils. Depending on the format and time available, students can take turns at directing the proceedings with a variety of methods. Good times to be rhythmologised include – diversity week, stress busting before exams, rapport building in years 7, 12 and first year of college, celebrations. 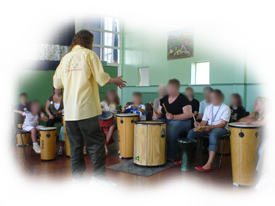 Formats of the school drumming or percussion workshops vary to suit the requirements of the school or other education establishment e.g. Year 3 upward – drum circle workshops with individual classes then all together for a massed Boomwhacker session at the end of the day. Fun team building exercise for staff training days. One of the things you will really love about our contribution to an INSET day is the way staff learn to co-operate during our rhythm activities. Junk percussion sessions to compliment recycling and environment awareness initiatives. Anger and stress management sessions - for students or staff.